HINT: Arrange the valve lifters in the correct order. (a) Using SST and wooden blocks, compress and remove the 8 valve spring retainer locks. SST 09202-70020 (09202-00010) (b) Remove the retainer, valve spring and valve. HINT: Arrange the removed parts in the correct order. 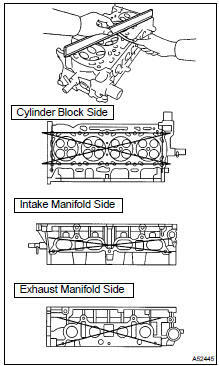 (a) Using a dye penetrate, check the intake ports, exhaust ports and cylinder surface for cracks. (b) If the seating is too low on the valve face, use 75 and 45 cutters to correct the seat. (c) Hand-lap the valve and valve seat with an abrasive compound. (d) Check the valve seating position. 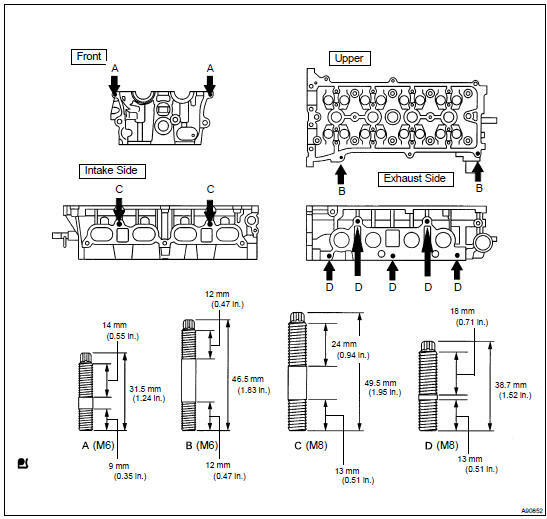 If the thrust clearance is greater than the maximum, replace the cylinder head. If the thrust surface is damaged, replace the camshaft. (e) Remove the bearing cap, and measure the Plastigage at its widest point. NOTICE: Completely remove the Plastigage after the inspection. If the oil clearance is greater than the maximum, replace the camshaft. If necessary, replace the cylinder head. If the oil clearance on the No.1 journal is greater than the maximum, choose a new bearing and install it. (a) Using a vernier caliper, measure the valve overall length. (c) Using a vernier caliper, measure the valve head margin thickness. Bush inside diameter: 5.510 to 5.530 mm (0.2169 to 0.2177 in.) (b) Subtract the valve stem diameter measurement from the guide bush inside diameter measurement. If the clearance is greater than the maximum, replace the valve and guide bush (see steps 18 and 20). 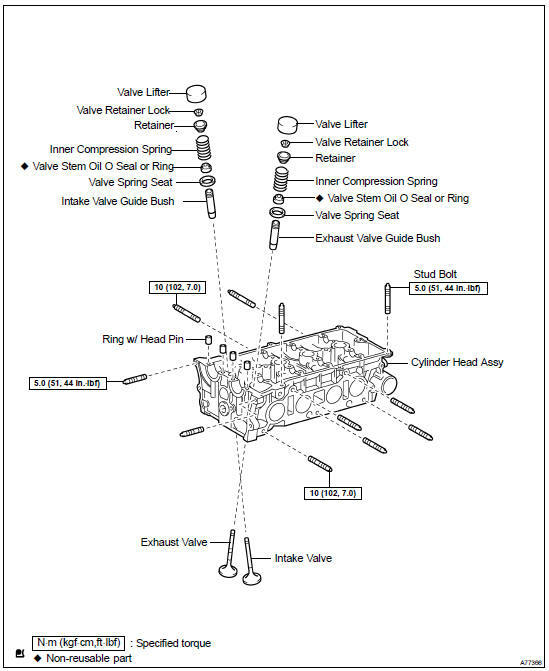 If the clearance is greater than the maximum, replace the valve and guide bush (see steps 19 and 21). (a) Using SST and a hammer, tap out the guide bush. Diameter: 10.285 to 10.306 mm (0.4049 to 0.4057 in.) (b) Install the STD bush if the diameter is within the specified diameter. If the diameter is not as specified, replace the STD bush. (d) Using a sharp 5.5 mm reamer, ream the guide bush to obtain the standard specified clearance between the guide bush and valve stem. (c) Subtract the lifter diameter measurement from the lifter bore diameter measurement. (a) Apply a light coat of engine oil on a new oil seal. HINT: The intake valve oil seal is gray and the exhaust valve oil seal is black. (b) Using SST, push in the oil seal. 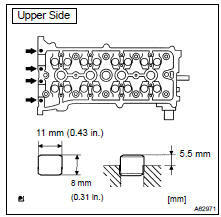 (a) Install the valve, spring and retainer to the cylinder head. (b) Using SST and wooden blocks, compress the spring and install the 2 retainer locks. NOTICE: Be careful not to damage the valve stem tip. (c) Using a plastic-faced hammer and a discarded valve with its tip wrapped in vinyl tape, lightly tap the installed valve to ensure that it is securely fit. (a) Assemble the valve lifter and the tip of the valve stem with a light coat of engine oil applied. NOTICE: Install the valve lifters in their original places.